Bananas - probably one of my favorite fruits around. Any of you out there as crazy about your Nanas as I am. I have them in the house almost every week. That being said, every once in a while, I end up with bananas getting a little over ripe. Have you had that happen to you? Stop! Don't throw it away. 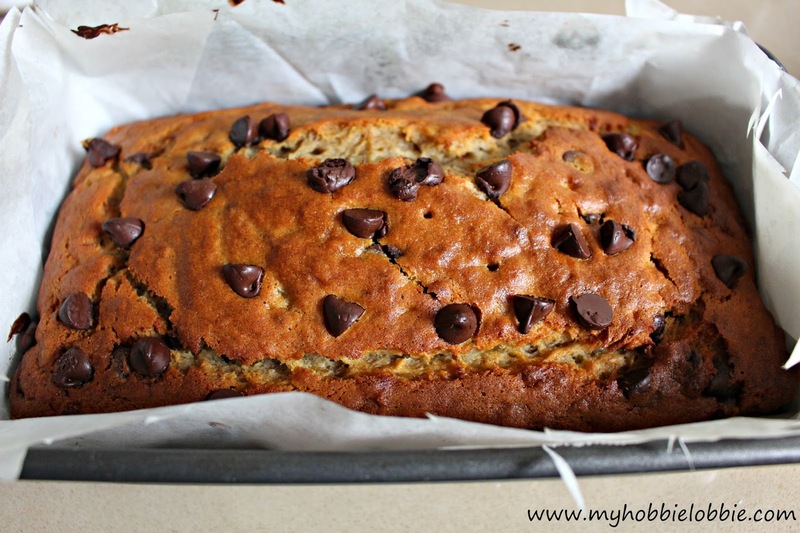 I always try and find ways to use up over ripe bananas too. Waste not, want not, right? 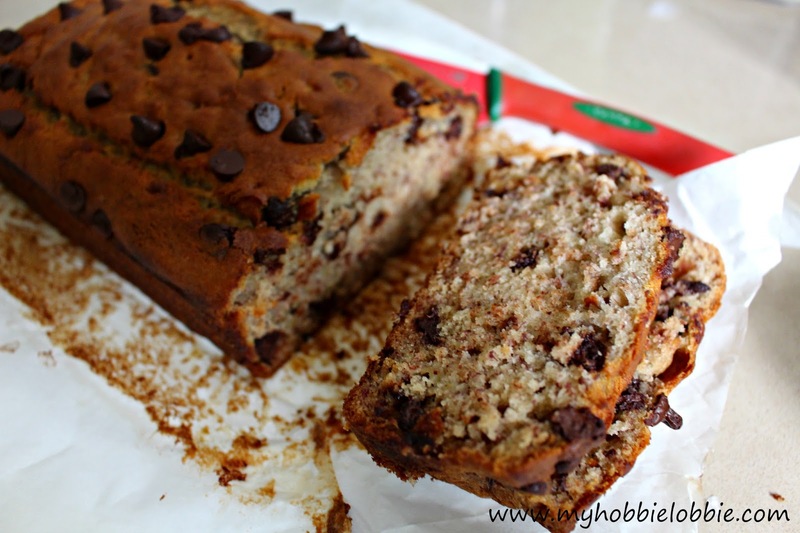 I'm always on the look out for new ways to use up these over ripe bananas. 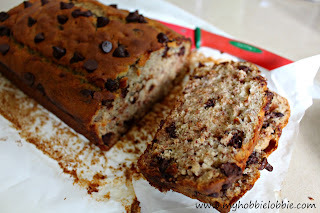 You may have noticed I have more than a few recipes on the blog that you can try out, if you need to use up some bananas. But this time, I wanted something a little more indulgent. On my recent trip to Costco, I bought a bag (a fairly large one) of bittersweet chocolate chips, so I thought why not use some chocolate chips in a good banana bread recipe. After a little looking around, I found one I knew was going to be great. Line a loaf tray with greaseproof paper and spray with cooking spray. I used my olive oil spray. 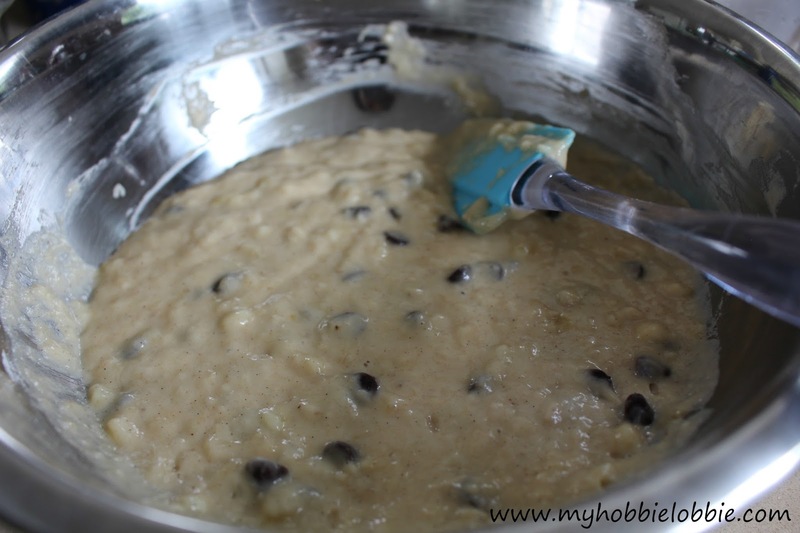 In a large mixing bowl, mash the bananas till they are mostly smooth. 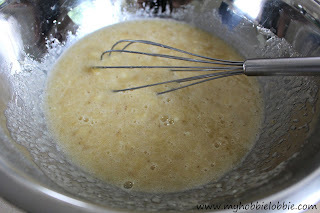 Add the egg, sugar, vanilla and oil and whisk to mix well. Next, add the flour, baking powder, baking soda, cinnamon powder and salt and mix till a batter forms. Do not over mix. Fold in the chocolate chips using a rubber / silicone spatula. 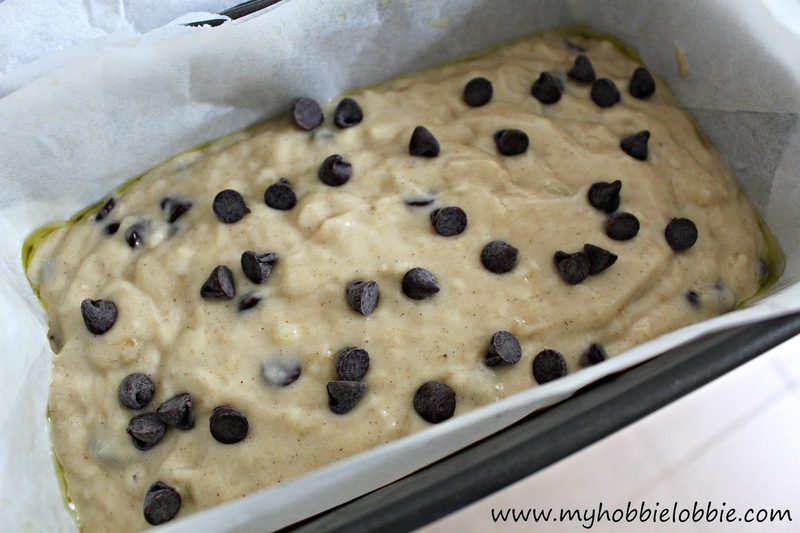 Sprinkle a few more chocolate chips on top if you like. At this stage, I would recommend slightly pressing these chocolate chips into the batter. It will look better this way. I didn't do that but will definitely do it the next time. Bake for about 40-45 minutes or till a skewer pierced though the centre comes out clean. Try and avoid piercing any of the chocolate chips. If you hit a chocolate chip, wipe the skewer down and check again. When it is done, take it out of the oven and leave to cool for about 10-15 minutes. Slice and enjoy with a hot cuppa tea of coffee or even some milk. Here's what the inside looks like. Yummmm!